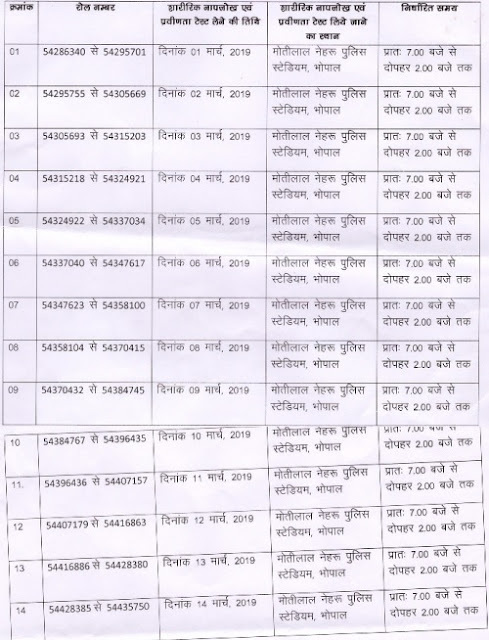 MP Vyapam Jail Prahari Notification 2018 Arrived, Last Date To Apply Is 25 Aug 2018. MP Vyapam Jail Prahari Application Form Available On Official Website. MP Vyapam Released PDF For 475 Posts. Stay With Us For MP Vyapam Jail Prahari Upcoming & Latest Jobs. Hello friends, let's talk directly about recruitment. The MP Vyapam department has recently released new notification. Which are being taken to recruit Jail Prahari. The last date for applying for this recruitment is 25 Aug 2018. Read full post for complete information about vacancy. See educational qualifications, fees, salaries and other information below. MP Vyapam Department Name - This recruitment is done by MP Vyapam. For information on upcoming recruitment of MP Vyapam on Gktricks.in to visit. MP Vyapam will be many recruited in 2018. You will notice that time to time via our website. इस नौकरी के लिए सरकारी वेबसाइट पर जाकर आप इस विभाग की पूरी जानकारी पा सकते हैं. MP Vyapam प्रत्येक वर्ष कई प्रकार की भर्तियो का आयोजन करता हैं जिसमे अधिक मात्रा में उम्मीदवार शामिल होते हैं. MP Vyapam की नौकरी में आवेदन करने से पहले आप यह जानकारी पता कर ले की यह भर्ती किस पद के लिए हो रही हैं. इसके लिए आप PDF फाइल को जरूर डाउनलोड करे जिसकी लिंक हमने निचे दे दी हैं. 475 पदों का वितरण सरकारी नियमो के अनुसार किया गया हैं. आवेदन करने से पहले जान ले की ST, SC, OBC, सामन्य और अन्य वर्गों के लिए कितने आरक्षित पद है. क्योकि किसी भी नौकरी में आवेदन करने के लिए यह जानकारी प्राप्त कर लेना काफी आवश्यक होता है की हम कितने पदों के लिए आवेदन कर रहे हैं. MP Vyapam Jail Prahari recruitment of academic qualifications would be required to join? This question will be in all the candidates too.If you want to join the recruitment, 12th qualification must have.For more information see the official notification. Below is the official notification. MP Vyapam recruitment should be the age limit to join in? The details of the information you read well. According to our information, the maximum age limit for recruitment to join is 25 (Other States) 33 (Only For Mp) years. Have a reservation at the age of different castes. This information is updated below. We mentioned above that of the general age limit. Which is the maximum age limit. ऊपर दी गई आयु सीमा सामन्य वर्ग के लिए है अगर आप आरक्षित वर्ग के अनुसार पदों की जानकारी देखना चाहते हैं तो निचे दी गई पीडीऍफ़ फाइल को डाउनलोड करके पूरी जानकारी प्राप्त कर सकते हैं. अधिक जानकारी के लिए आप हमें कमेंट भी कर सकते हैं. Fees Details : Must read the official notification for information on fees. Candidates who receive a discount on age,important to keep your certificate. General candidates to join the MP Vyapam recruitment fees - 500/250 Rs. The fees above General / ST / SC / OBC classes is different. Complete information are given below in related fees. MP Vyapam will recruit to join the interview? Interview Tips sure you read above. Selection will be by interview of MP Vyapam.Use our website to see the results of interviews.Which is created by a few of our interview tips given above. For more information read our old posts. View results online? The test results you can see online, mobile and laptop. Given below for which you have to understand the process carefully. Written test or interview results are expected within 30 days. We will give you notification on the results. Your mobile / laptop must have an Internet connection. Open Your Mobile Browser Like (Chrome, Mozilla And etc). Open to the official website of MP Vyapam. Go to result section (MP Vyapam Result). Put Your Roll number and press OK. Your results will be displayed. Do not forget to print out the results. It will work in the future. Useful Topics About MP Vyapam Recruitment 2018 : Some useful topics is given below. Which is concerned with the rec ruitment. Official details are given below. Last date to apply before. Subscribe us to know about the future MP Vyapam Recruitment 2018.